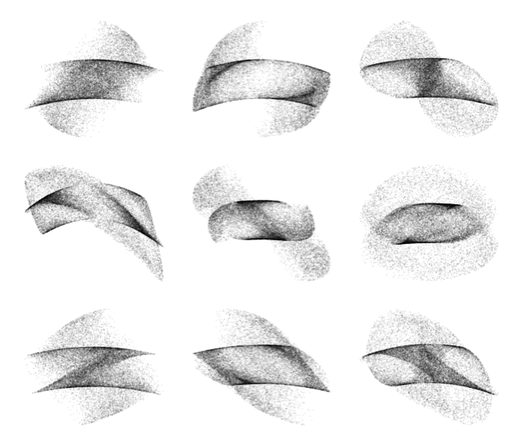 Beautiful plots while simulating loss in two-part procrustes problem | "R" you ready? with denoting the Frobenius norm, is an unknown scalar and an unknown rotation matrix, i.e. . , and are four real valued matrices. The minimum for is easily found by setting the partial derivation of w.r.t equal to zero. By plugging into the loss function we get a new loss function that only depends on . This is the starting situation. When trying to find out why the algorithm to minimize did not work as expected, I got stuck. So I decided to conduct a small simulation and generate random rotation matrices to study the relation between the parameter and the value of the loss function . Before looking at the results for the entire two-part procrustes problem from above, let’s visualize the results for the first part of the loss function only, i.e. as input matrices. 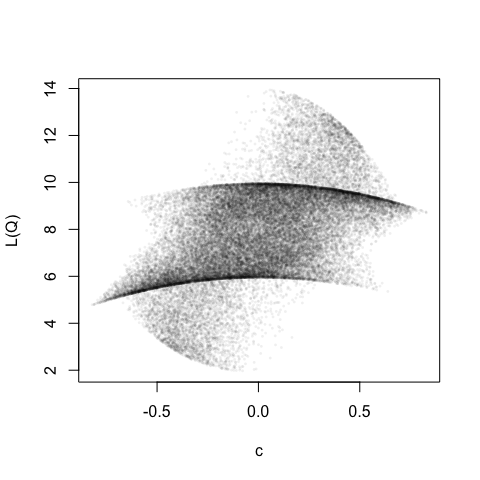 Generating many random rotation matrices and plotting against the value of the loss function yields the following plot. 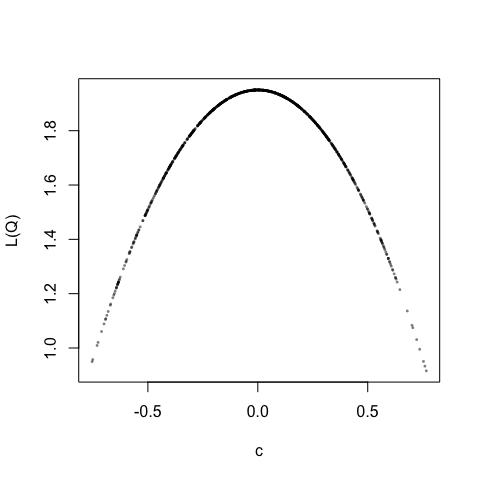 Here, we do not have a one to one relation between the scaling parameter and the loss function any more. I do not quite know what to make of this yet. But for now I am happy that it has aestethic value. 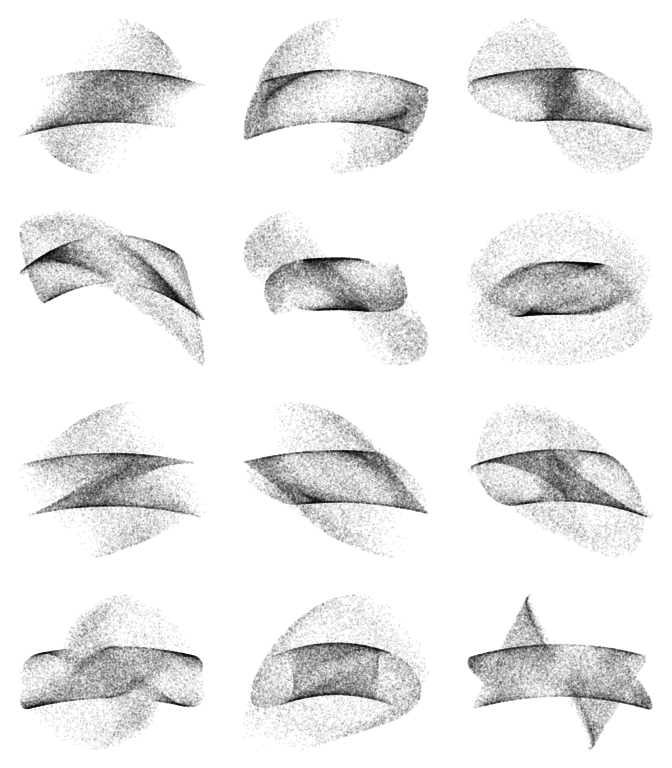 Below you find some more beautiful graphics with different matrices as inputs. So, probably one or more packages are required. If so, which are these? Hi Eric, you must load the ‘plyr’ package. I fixed it in the code. Thanks. Hi Mark, I’m Brand new to R and just started blogging about it as well to help me remember/learn it. Thanks for your blog. Is there a contact page on your wordpress site? I couldn’t find one. I found you R Google search blog incredibly helpful, and had a question, but i think the comments were closed. https://ryouready.wordpress.com/2009/01/01/r-retrieving-information-from-google-with-rcurl-package/. I recently used it to grab all locations of a particular company across the US. I was curious if there was way to get to page 2 of Google using that code? glad that you like the site:) Concerning Google, you can pass the ‘start’ parameter in the GET request, e.g. ‘start=10’ to get the second page. If you are not familiaer with the structure of GET requests, you may want to read about that first..